Fraser and I stood in the middle of the Green Room at The Bedford and cast our eyes over a treasure trove of band and rigging paraphernalia, temporarily put to one side. Well to all sides. Scribbled walls stacked with lighting heads, gels, mixers, cables, benches and chairs. A piano leaning dormant in the corner, a thick green glased bottle of gin under it’s stool – still standing stoic as if utterly assured of it’s sense of belonging here, it was soaking in years of musical wizardry and a last swig remained. Perfect. We got elbows deep in it and set up for the photographs. …gives me an intimate view on the nuts and bolts of a band’s workings. I’ve followed Honey Ryder since the band began, and over the past year have had my camera to hand whilst doing so and happily lugged a few things as well. So I ditched the flash, learnt to switch fast between lenses, fired off semi-automatic to let the camera manage some of the exposure calculations, and kept the ISO high accepting some grain is part of the live atmosphere. Sorted. Or not quite. Then switch photography to candid backstage style and aim to ninja about (less seen) in the green room to capture nuance and interaction. Oh I forgot the initial rigging and sound check shots for the band at the beginning! I love it, and half the time I turn the photos over to black and white to keep a journalistic feel, because its a story. Its a story of a band’s hard work, talent, creativity, dedication and relationships blooming in syncrony for the big moments on stage, and then deepening their experience together after it. It’s also a story of how I learn to interpret that in my images and my relationship with the band over the years. I’m a keen, close visual narrator. I was delighted to join Dale Stephens in photographing the wedding of Aaron and Terry at Northcote House in Ascot. The setting was the grand Grade II listed Neo-Georgian mansion, the excitement of the wedding party infectious, and our hosts at Northcote House professional to the last. My role was to focus on reportage shots of the party during the course of the day, a style of photography that I love. Being present but less seen, I skirt the edges to capture people’s expressions in interaction with others, and moments when they become the observers, standing on the sidelines taking it all in. Wedding days are special days, precious moments flying swiftly by; our job to try and still those for just a second so they can be looked back on, taken in and loved again. Under the shady trees rushing by to my left, a red carpet of leaves set fire to the woods. I pulled over to stare hard, it was stunning, but moments of light were eeking away into the dusk and I’ve never pulled my camera and Jack out of the car so fast. He ran around my feet while I tried my best to find the exposure that would work – frustrated – I don’t want to have to pull this up so much in Post! Trying to keep my brain thoughtful in a fizz of excitement is a feat I’ve rarely managed. Figuring through the magic triangle of ISO, aperture and shutter speed, I found that very small part of my brain that deals with numbers threatening to bolt out the stables. 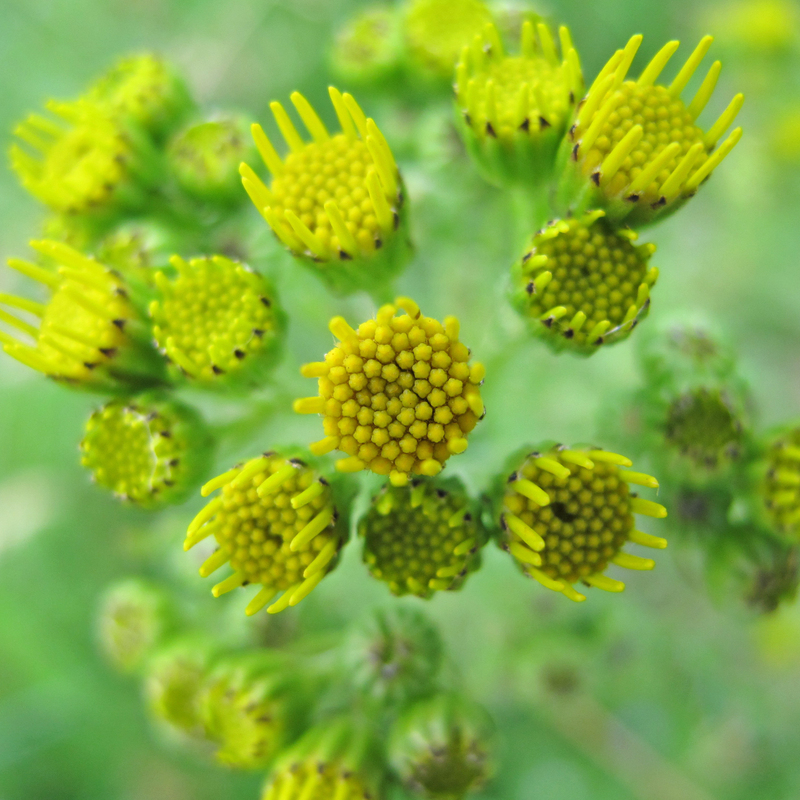 C’mon… work it through…breathe (meditation helps in surprisingly diverse moments). Clicking through the stops I realise this one’s got to go manual to try to get what I see. I rotate the clicks to big scary ‘M’ in the hope I’ll get something before the sun says sayonara. I still needed some of the magic dust of Post courtesy of Photoshop, but it was much less than before, but a light sprinkling of it. When I look through the frames, I can see I’m getting there. 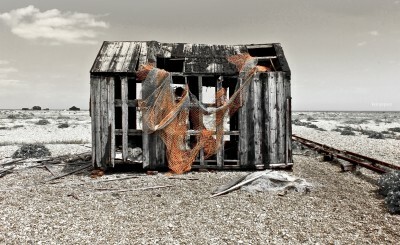 Dungeness was made for photographers. When they set down those boat wrecks just where they did, lay down a few of those disused, rusty, skeletal rail lines and festooned decrepit fisherman’s huts with holey fishing nets, clearly it was all for us. I’d seen some great shots and I’m a sucker for a wreck, so off I went with Jack the Russell in tow. Given that he has a pebble fetish, I looked forward to seeing a shingle beach give him some kind of mind boggling rush on a Sunday afternoon. A stunning day, and people along the line of the coast were happy to point me ‘in the direction of the boat wrecks please’. My orienteering remains legendary. I couldn’t decide whether to keep the beautiful colours or go mono, as both would have done justice to that dystopia by the sea (so close on hand to a lovely nuclear power station). SO i went for both, manhandling different colour channels in a way of not tried before. I’m pleased with my experiment, but this was only one way of skinning that cat,I may return to the images for a different edit at some point. I hope you enjoy the shots, they’re here in my kempspace gallery. As for Jack, sheer overwhelm kicked him into narcolepsy on the drive home. I still admire his persistence in trying to find the one pebble I’d throw in a sea of others. There’s a life lesson there somewhere. My camera is a tool for meditation, focusing my mind behind the views my eyes find. Taking time out from the multi-tasked, multi-voiced cacophony of the daily demand, I return to my lens guide. I scan for small things taken much for granted which shouldn’t be, things often unseen, seemingly inconsequential, but are masterpieces simply lost amidst the inane. Holding a quiet, steady frame behind the widest aperture, I trace macro sight around a small bloom’s newly disclosed detail, in awe of it’s intricacy and tiny structures. My close focus rests en pointe. My fingers move around degrees of sharpness until the protagonist petalled part is illuminated against a blur of background. I take the shot, then seek again. The absorption in this cycle is mindfulness in action; breathing slows, mind coalesces around it, and contentment seeps through the bones of me. Through the park to the woods on the other side, I’m hunting dappled shade in the bright midday sun, the only solace for my camera’s sensor from the whitewash of overexposure. My eyes find possible frames and the world falling outside of them falls easily out of attention. Lets see if there are any shots to be had in this wooded half light. I’ve not been here before. Two ‘it’ll do’ lenses in my bag (kit zoom and 50mm prime) and I find myself hungering after that elusive wide angle. Expensively evasive. Well, another day another dollar (…or several), until then these two are trusty. The Jack Russell is joining today, he never fails to find all sorts to entertain his curious mind on the trail, happy to do the walk-and-pause that frustrates most non-photographers. Perfect company. I’ll be hard pressed to get a shot without something of him in it, as he loves to hoard my focus. We choose our wooded path and further in it opens to a stream in a clearing… mirrored reflections? Longer exposures for smooth waters?… I see a nook where knarled trees, irises and water seem to form their own tight composition. I smile then click at the haven. The wood trail continues, we saunter for a while and my eyes just can’t find a fit. More and more I’m thinking before shooting. Quite suddenly, we pop out from under the cool umbrella of trees onto a small country lane and into the sun’s heat. Across the way is clearly the road to the Wizard of Oz. I secure Jack to one side in case of traffic and play with focus on the fence and field beyond. He eyeballs a vintage car as it passes at lazy summer speed and I curse for not being quick enough to shoot it before it turns a bend. Despite the lure of the yellowed dirt road to an emerald forest beyond, I decide I’ve done enough hunting for courage, wisdom and heart recently and besides, Jack has scented something more interesting, probably a fox. We turn back. Skirting the trail round just inside the woods, Jack and I get a run for a while until I spy a profusion of bright irises beaming from the murk under a tree. Stop! The contrast is perfect. Jack skids to a halt and I move around capturing green vertical stripes interrupted by bursts of sunshine bloom. The lane we had been on a while back must bend around the woods not too far from where we are, as the tinny melody of an ice cream van interrupts my absorption. I stretch my legs from kneeling at iris height and pause. The world’s re-entered the frame, I’m thinking about cool vanilla in a crispily chewy cone with a chocolate flake and I know I’m done with shooting for a while. I’m hungry, though not as hungry as for that wide angle lens. Jack? He doesn’t care about breaks for ice cream, he knows I’ve got treats in my pocket. 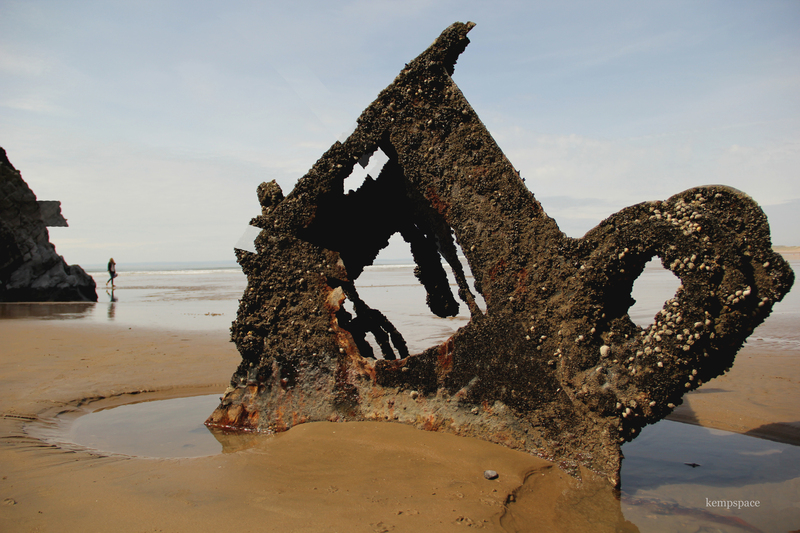 The Gower coastline raises wonder at its beauty, the spectre of skeletal old wrecks, and the eyes of climbers assessing their prowess against the routes that trace the sea cliffs. 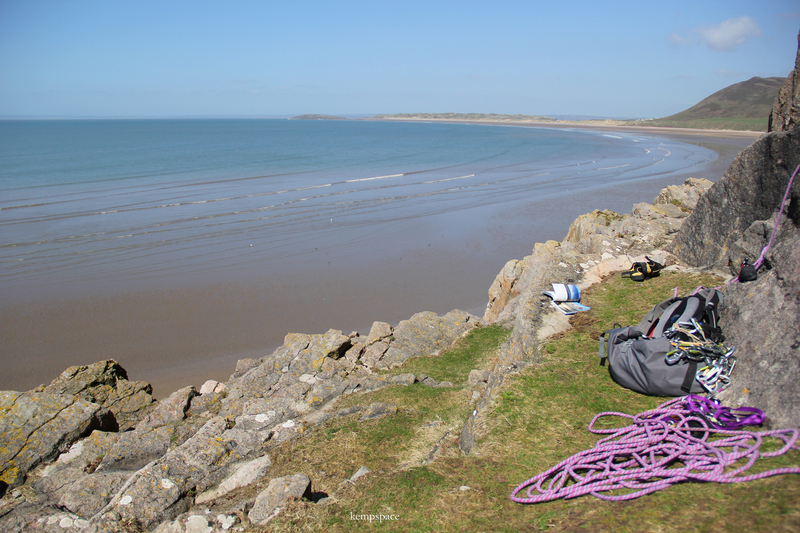 For those who like climbing with as much of a salty sea breeze through their hair as chalk through their fingers, many routes at Rhossili Bay are launched from one foot on the sand whilst the other aims for purchase on the first hold. 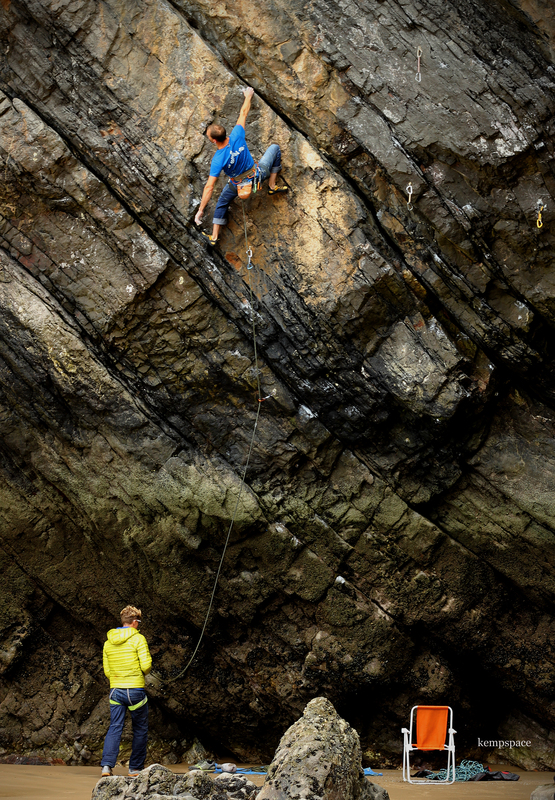 Ramon Marin on One Ton Depot, 7b at Shipwreck Cove, Rhossili Bay. There are both bolted sport routes and trad lines on these sea cliffs in the Bay, and in between, the Vennerne shipwreck makes for a wonderful subject as the tide drifts out and leaves its bones exposed. On trips over the last couple of years, I have been increasingly caught up in photographing the beauty of the places we visit to climb, rather than the climbing itself. 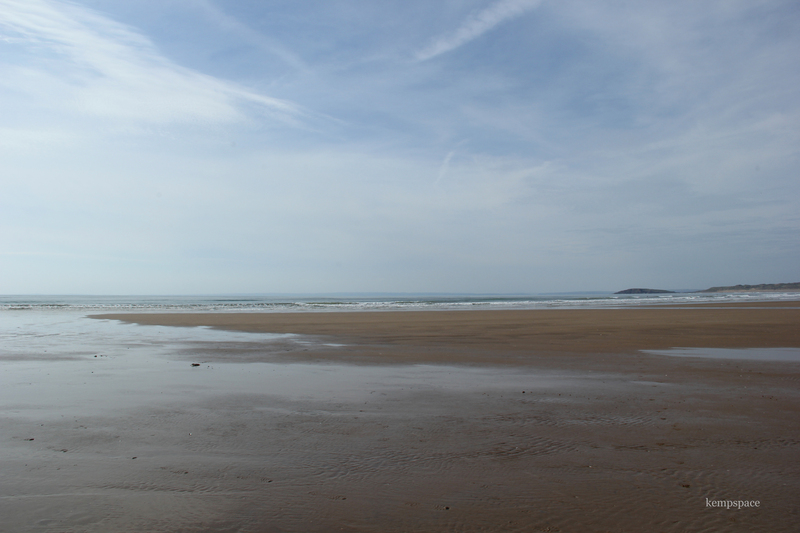 With my feet planted on the expansive flat mirrored sands at Rhossili, I watched the sea recede to meet the horizon line and gently highlight it with silver. My breathing slowed and I stood lens-captivated, chasing bolts on the sea cliffs far from my mind. If this wasn’t gift enough, a day spent further inland at Dinas Rock saw climbing routes surrounded by a seemingly magical gloaming, fit as a setting for any fairy tale. Within it’s verdant wooded enclaves, a river and it’s waterfalls ran through the rocks, the babble enhancing the mindful focus of the climbers breathing their way through each vertiginous move. Again, my attention was caught by the unusual mossy-green midday twilight whilst my companions followed the chalk-lit path to top out their routes. I think I know where my route lies. Simon Rawlinson and his gorgeous dog Tufa. 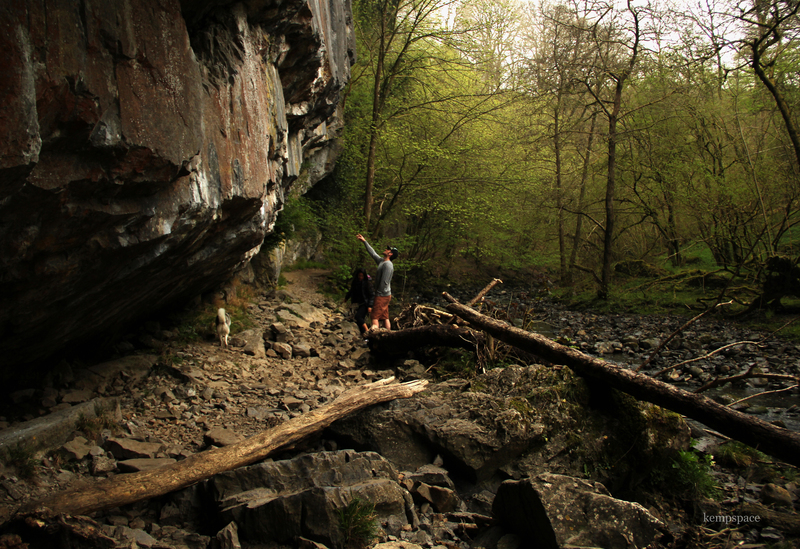 Simon, Head Performance Coach at Make the Next Move, points out the climbing routes at Dinas Rock in South Wales. 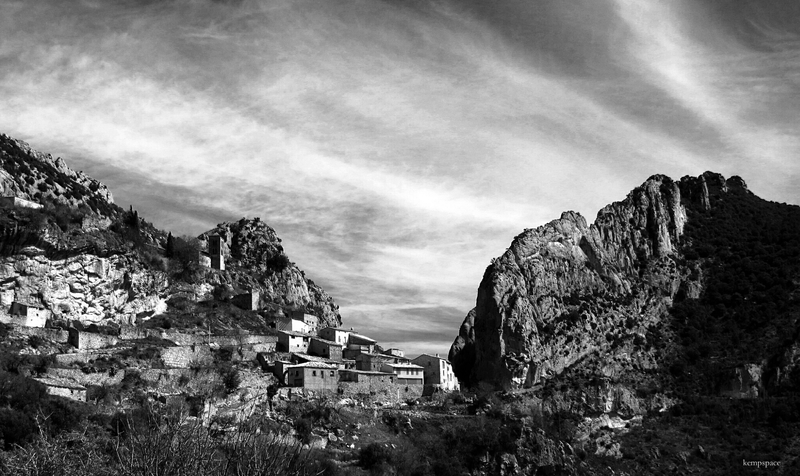 I had the joy of visiting Abella de la Conca in Northern Spain and photographing the community of climbers, walkers, photographers, yogis and nature lovers who visit Nic and Ella’s Eco-refugi and it’s beautiful surroundings. I know them originally through a close knit, warm and friendly climbing community. Abella Climb is a not-for profit organisation run by Ella and Nic, which aims to establish holistic, sustainable access to outdoor activities in the local area, including rock climbing, mountain biking, walking, canyoning and yoga. They want to raise the profile of the beauty of the local area and are dedicated to preserving its natural and historical patrimony. They will develop a sustainable, permaculture-based approach to local land management including tending their own olive groves and fruit orchards and raising an organic kitchen garden. Ella and Nic have renovated the Eco-Refugi with their own hands and those of a community of volunteers, to be in keeping with local character and it’s history. They and their two lovely boys live there, at an altitude of 1000m, in the heart of Catalunya’s most spectacular village, Abella de la Conca. Their welcome is warm and their knowledge of the area unparalleled. The Eco-Refugi is part of the Abella Climb association and staying in it offers a contribution to developing their project aims. I will be going back with my camera and climbing gear for sure. I was invited for a day trip up to The Rock and Bowl Festival by Honey Ryder last weekend, to get some backstage-eye-view shots of them setting up and performing. I have a penchant for black and white reportage and this is one of them – a sneak peak of my editing so far. I thought I’d save black and white for set up, then colour punch for the performance to equal the power packed by the band’s set that day. I travelled up on the road trip with Lindsey O’Mahony who fronts Honey Ryder, watching Hertfordshire turn into the dulcet toned rolling countryside of Shropshire. We met Jason Huxley, Matt Bishop, Chris Cliff and Tom Bishop on location and the band was complete. 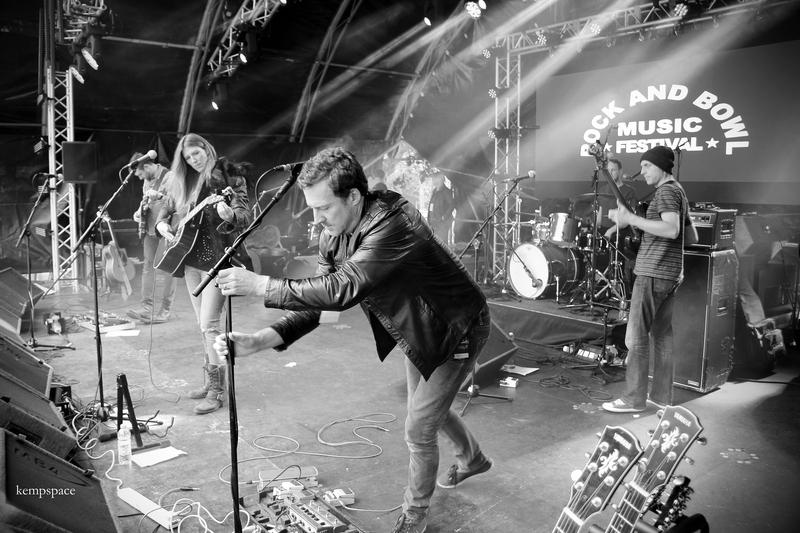 The Rock and Bowl Festival was set in the midst of a very green and pleasant land indeed, and hosted a warm and engaged crowd ready to shake it out hard to bands playing it out loud. For me, this celebrated the start of festival season, a hope for a great summer to come, and a wicked chance to get my eye in on a new subject for my photography. Thanks Honey Ryder, you rocked my world, and just about everyone else’s.